Russia’s first “fifth-generation” fighter made its debut today on a snowy airfield in the country’s far east. Russia's first "fifth-generation" fighter made its debut today on a snowy airfield in the country's far east. Sukhoi test pilot Sergey Bogdan took the company's PAK FA prototype aircraft on a 47-minute flight before returning to the factory runway at Komsomolsk-on-Amur. Bogdan reported that the new fighter was "easy and comfortable to pilot," according to a company press release. 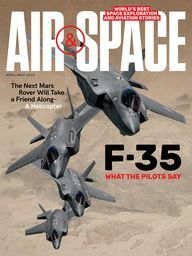 Exactly what constitutes a fifth-generation fighter is open to some interpretation, but the PAK FA now appears to join the U.S. F-22 Raptor and F-35 Joint Strike Fighter at the forefront of modern military aviation. Russia Today has video of the first flight, which, despite the title, could hardly have been "Top Secret" if it's on YouTube.